1.In a 3-1/2- or 4-quart slow cooker, combine potato, carrot, onion, celery, mushrooms, garlic, thyme, sage, salt, and pepper. Sprinkle tapioca over the mixture. Top with chicken thighs. Pour broth over all. 2.Cover and cook on low-heat setting for 6 to 7 hours or on high-heat setting for 3 to 3-1/2 hours. 3.Remove chicken from slow cooker. When cool enough to handle, remove meat from bones and coarsely chop; discard bones. 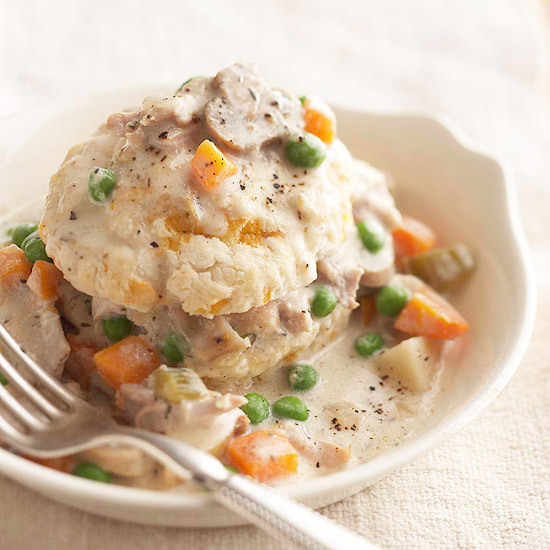 Return meat to slow cooker along with peas and cream cheese. Cover and cook for 10 minutes. Stir well; serve with Cheesy Biscuits. Makes 6 servings. Directions1.Preheat oven to 450 degrees F. In a medium bowl combine biscuit mix and cheese. Stir in milk. Turn out onto a floured surface and knead 10 times. Pat into a 1/2-inch-thick circle. With a floured 3-inch biscuit cutter cut into rounds. Reroll scraps as needed. Place biscuits on an ungreased baking sheet. Bake for 10 to 12 minutes or until golden brown.